When I bought my new Samson Juicer, one of the things that surprised me was how easy it was to clean. Thankfully many modern machines are designed with this in mind, so cleaning juicers should not be a big issue. Let’s look at the top tips on cleaning juicers so that you can get all of the benefits that juicing provides while avoiding those cleaning headaches. Clean up immediately after making your juices. If you wait to clean the juicer until later, you are going to be very sorry. Use lukewarm water to clean the juicer parts, and remove any residue or pulp. Do this as soon as you are finished making your juice and it will come off much easier. One of the hardest things to clean is the mesh piece that separates the juice from the pulp. 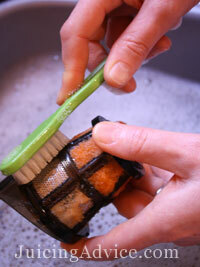 You can use a brush of some kind (like a toothbrush) and scrub it under running water to remove the pulp. Usually taking just 3 to 5 minutes to clean your juicer after using it will be all you need to be prepared for the next juicing event. 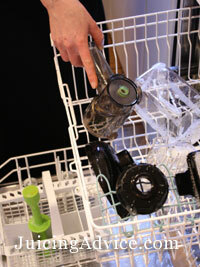 Check to see if your juicer’s manufacturer’s recommends washing any of the parts in the dishwasher. If so, this will save you some time in cleaning your juicer. If the manufacturer’s instructions make no reference to dishwasher safety, then only wash your juicer by hand to be on the safe side. Some juicer parts might be better left to soak if you’re not going to wash up immediately. When looking to purchase a juicer, understand that centrifugal juicers and those with twin gears tend to take a longer cleaning time than those with single gears. Make sure you wash all of the parts individually so that you can remove any leftover remnants of pulp and other particles. This will ensure that the juicer is clean and not harboring any bacteria later. Purchasing a juicer is a great way to invest in your long term health and wellness. 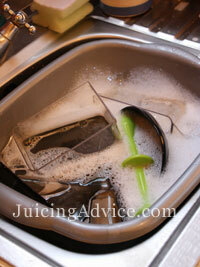 However, you want to make sure you know that cleaning juicers can be time consuming if you choose the wrong juicer. I know that when I purchased my juicer I investigated how easy it was to clean before I bought it. My Juicer takes no time at all to clean which means I use it all the time.